Laos is considered to have the most important national elephant population in Indochina. Historically, the country has been known as ‘Lane Xang’ or ‘Land of a Million Elephants’. However, today Laos’ wild Asian elephant (Elephas maximus) population is estimated at between 500-1000 individuals, just one-third of the numbers of two decades ago. Threats to the elephant include loss of habitat as a growing human population results in encroachment into the elephant’s ancestral home. As this occurs, elephants may wander from the forest onto farmers’ land, destroying crops and damaging property, leading to human-elephant conflict. Habitat loss also creates the danger that elephants are unable to follow ancient migratory routes. Small, fragmented populations then become isolated, unable to connect with other herds and in some cases this leads to inbreeding. One of the greatest consequences of this is low breeding success and high juvenile mortality. Poaching too remains a serious problem with demand for ivory and hides in countries such as China fuelling illegal activities. Despite the 1989 Convention on International Trade in Endangered Species of Wild Fauna and Flora (CITES) that banned the international trade in ivory, a thriving market still exists. 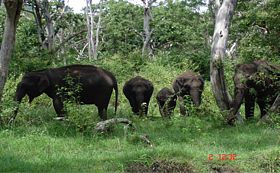 In Nam Pouy National Protected Area (NPA), WWF works to restore, maintain and increase the population of Asian elephants, of which there are an estimated 50-60 individuals. Through increased data collection by NPA staff, improvement of land use practices, law enforcement patrols and guidelines to reduce human-elephant conflict, these magnificent creatures retain hope of survival. Elephants need to eat 150kg of vegetation per day to survive and the average lifespan of an Asian elephant is up to 60 years in the wild.